I’m not going to lie. 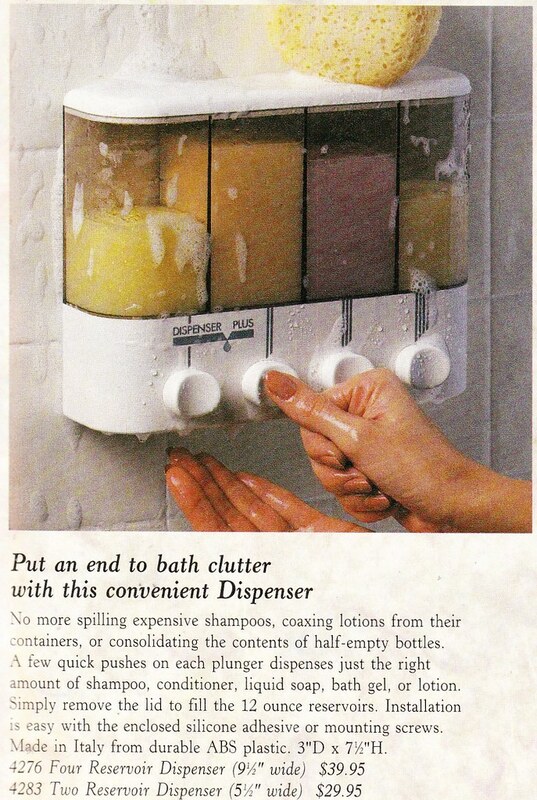 I’ve wanted one of these shampoo/conditioner dispensers since I first saw them in SkyMall magazine back in the day. What’s the fourth slot for? I see two slots for shampoo and conditioner. A slot for body wash, I guess, if you use that instead of bar soap. But what about four? The description says…lotion? I don’t know if I agree with that, but I’m sure I can find something to put in there. This is not a bad idea, extra seating for your living room/den for when you run out of couch space. But why is the family in the picture sitting in the seats like TWO FEET from the TV? 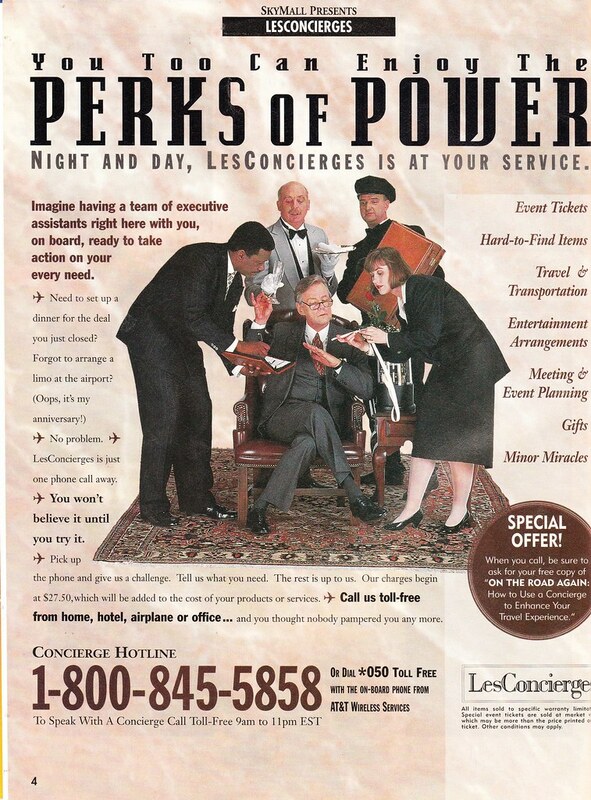 Where are their couches? Shouldn’t they just be sitting on said couch? Wouldn’t it make more sense to show a picture of a couch full of people with these seats in front? Bizarre. And what the hell are they watching? Lots and LOTS of self help tapes. The 80s-90s loved this stuff. 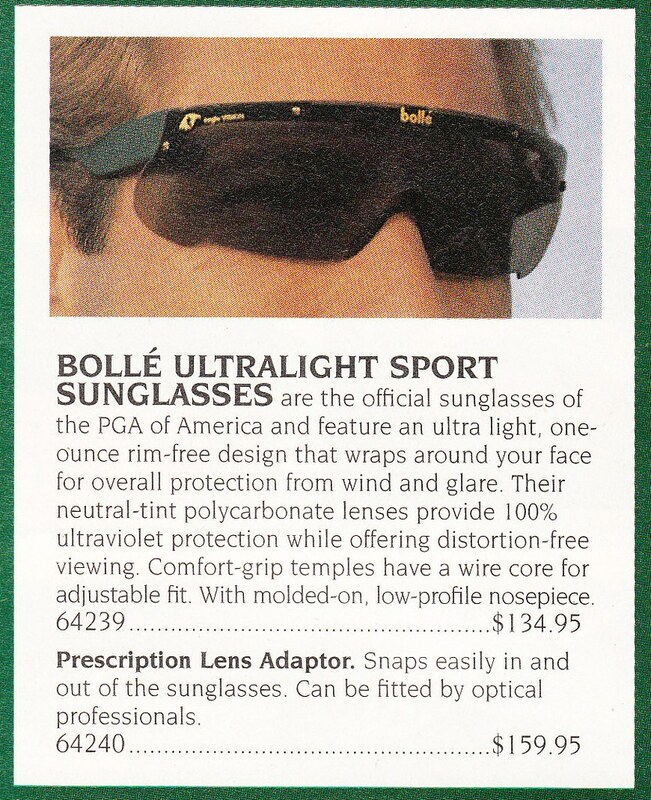 I remember several of these being sold on late night infomercials. 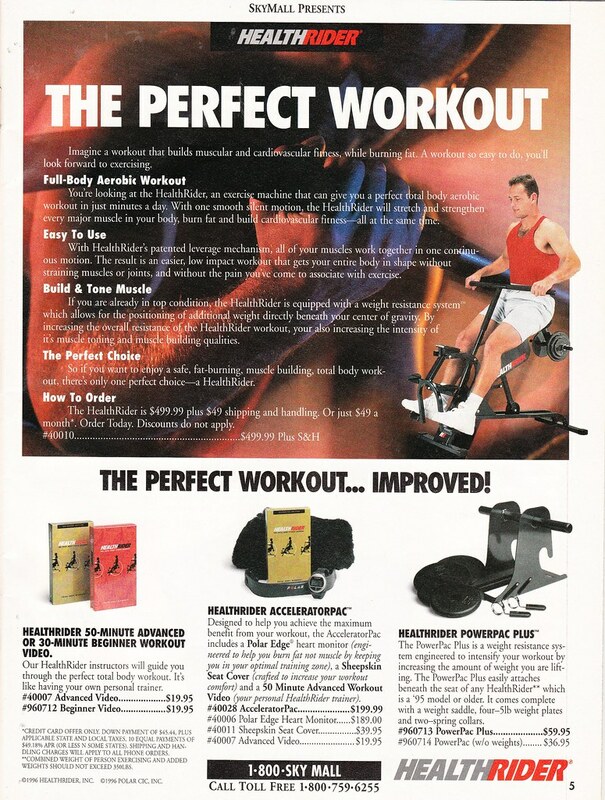 Especially that Mega Memory set from Kevin Trudeau. And, wow, Pistol Pete Maravich’s Homework Basketball. That’s a pretty awesome video set. 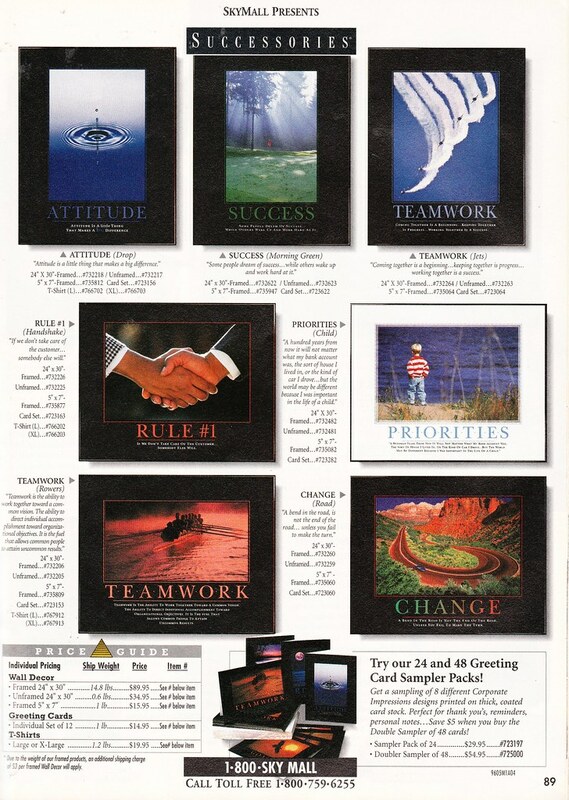 Also, lots and lots of motivational posters. However, these posters are not motivating enough to get me to pay $90 for a framed copy. So maybe they should be called “not-so” motivational posters. 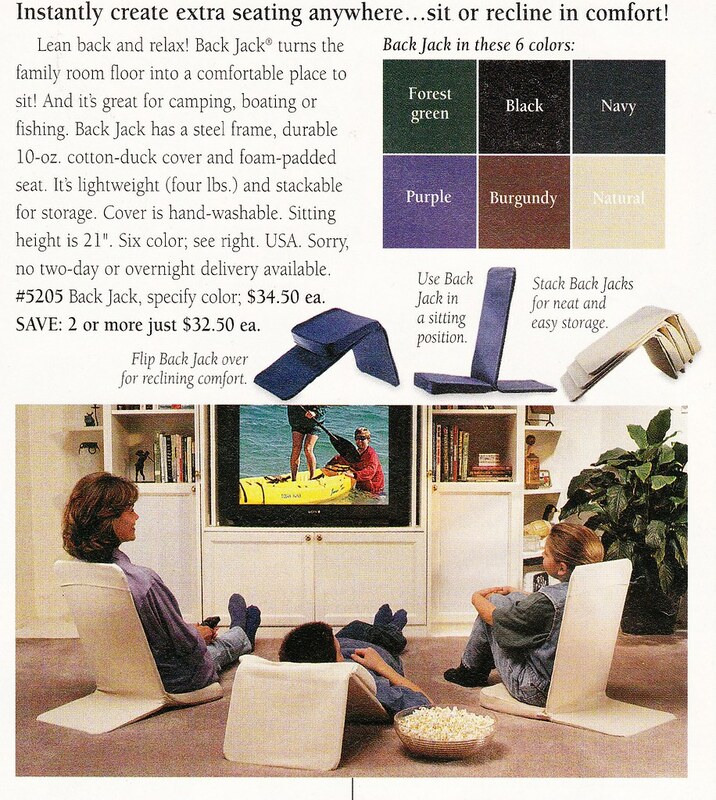 Wireless ANYTHING in 1996 was like living in the future. 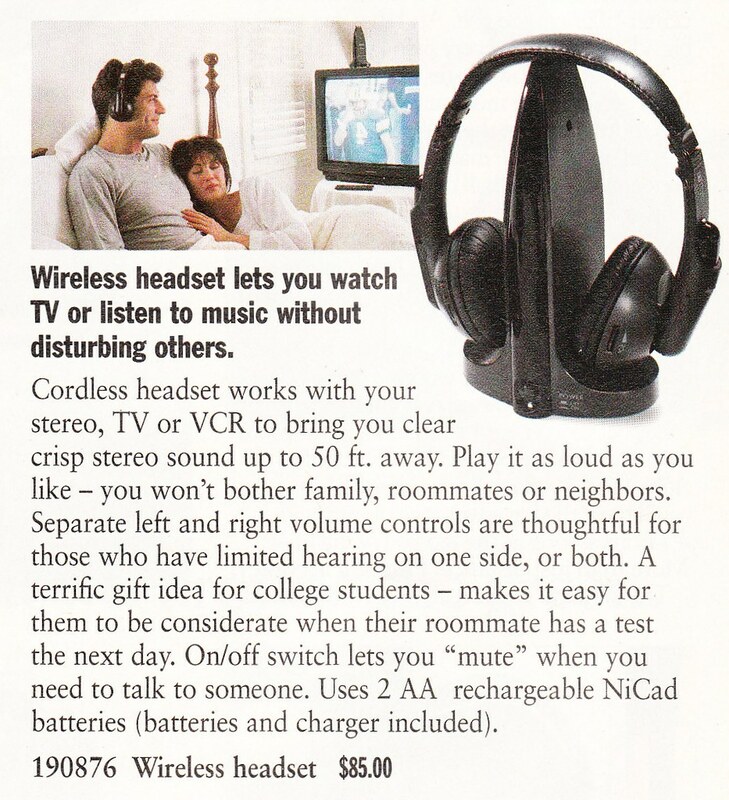 I didn’t realize this wireless headphone set had been around since 1996. I’ve wanted a pair for a long time because it would come in handy when my wife falls asleep on the couch and I’m trying to be quiet watching a movie/TV show that inevitably wakes her up with gun shots or loud screaming. 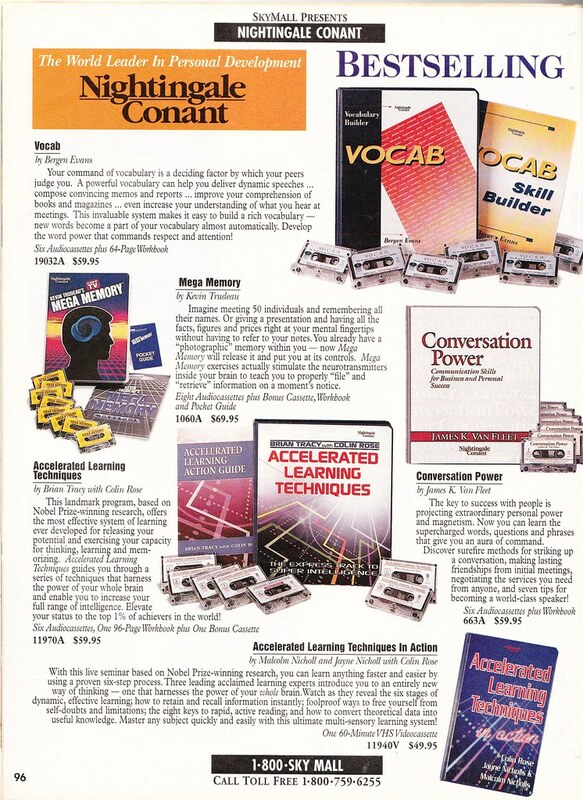 It may be hard for some of you to remember when having an entire set of encyclopedias on a CD-ROM was a big deal. 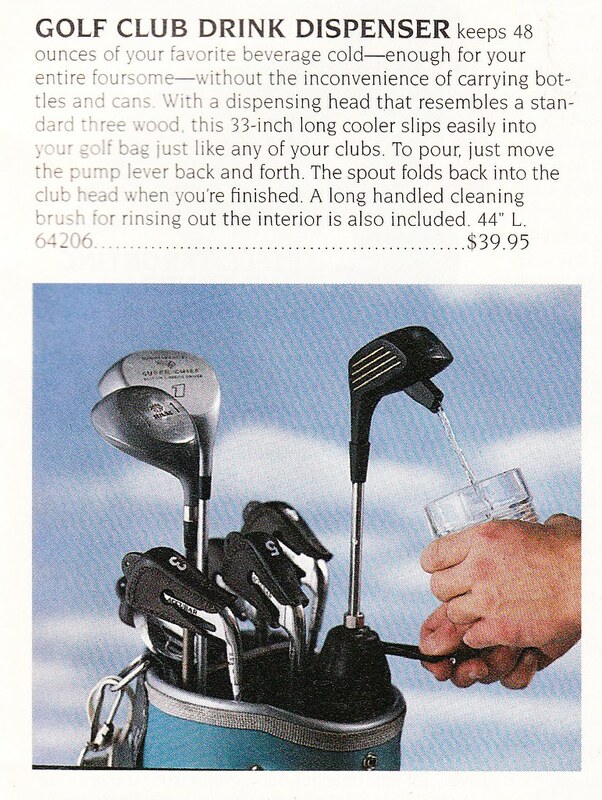 Look at that catalog price: $495.95! And that’s DISCOUNTED! Bananas. Back in the mid 90s, I wanted Microsoft Encarta SO GODDAM BAD I could taste it. Now, whatever information I could possibly want (as well as tons of information that I don’t actually want) is just a Google or Wikipedia entry away. But back then, these CDs were our Wikipedia. 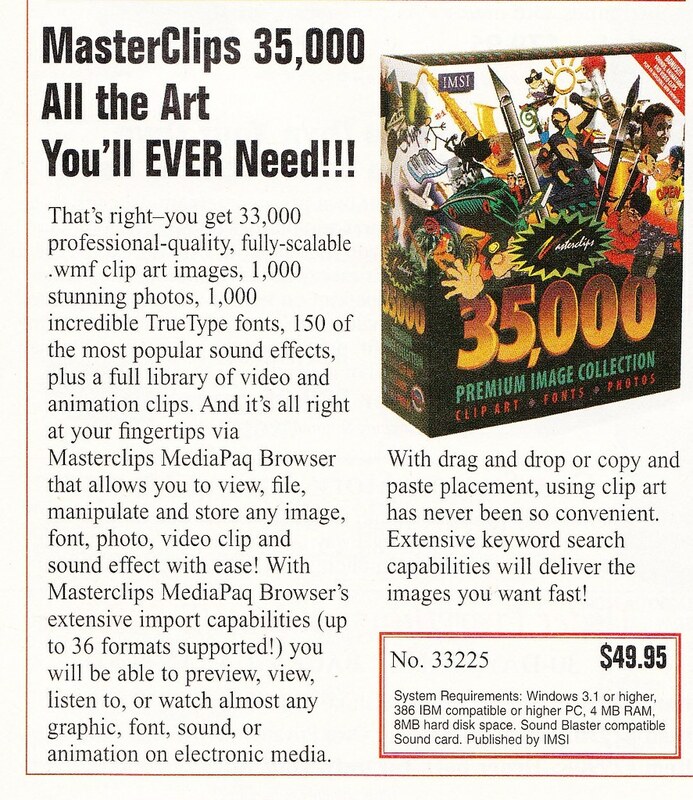 Usually sold alongside the giant collections of encyclopedias on CD were giant collections of clip art. All the images you will ever need. EVER. Never use another image after you pay $50 for a collection of generic 8 bit art that looks like it was rejected from the MS Word 95 clip art gallery. Again, I’d be lying if I said I didn’t own at least one mega clip art gallery CD. Lots of vintage tech goodness on this page. In the upper left is a dedicated cordless phone for dialing 911. Yes, a separate phone that’s essential function is to call 911. That’s it. 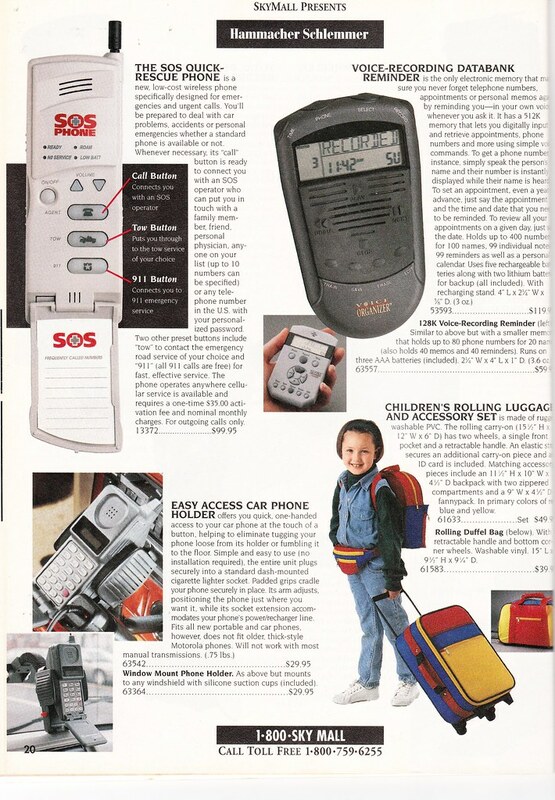 In the lower left is a phone holder for the 1996 version of a cell phone. Check it out, it looks like the entire bridge of the USS Enterprise. It’s HUGE. Oh, do you need a hands free accessory for that brick? Check one out right here. Try not to chuckle as you check out the electronic databank reminder gadget in the upper right. 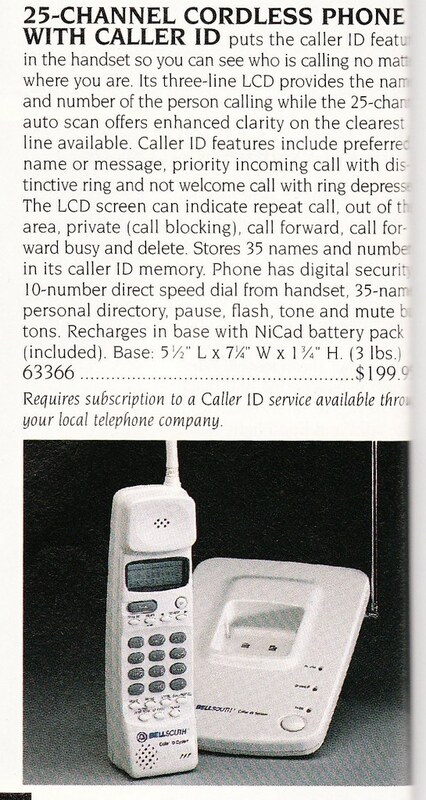 Back in 1996 your cell phone’s ringer had two modes; ON and OFF. There was no “vibrate” setting. To get vibrate, you had to buy a separate battery that had the vibrate feature built in. I told you, 1996 is like the Stone Age at this point. 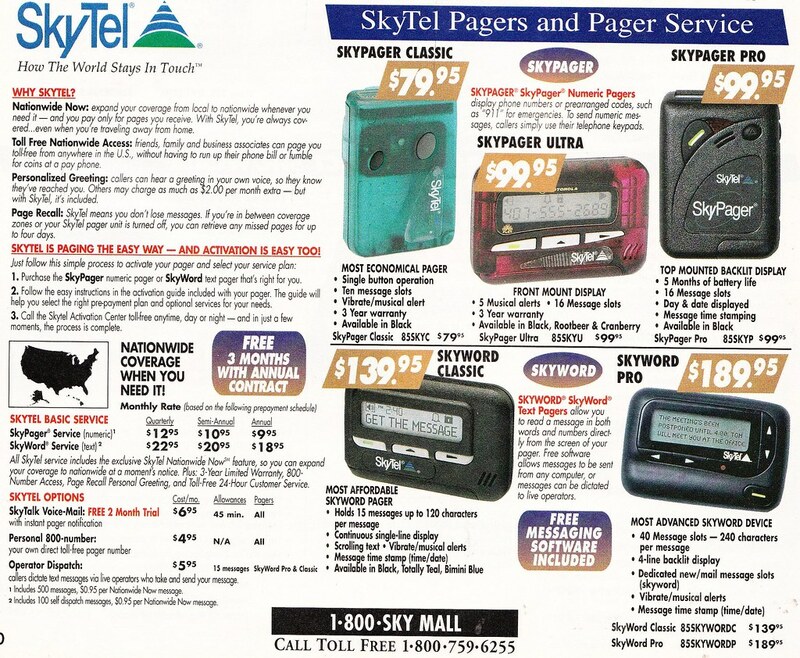 Does anything scream “1990s!” more than a Skytel Pager? Does anything scream “Drug Dealer!” more than a Skytel Pager? Let’s check out a bunch of fancy gadgets from 1996 that have all been replaced by the iPhone. It has Caller ID! Adorable! 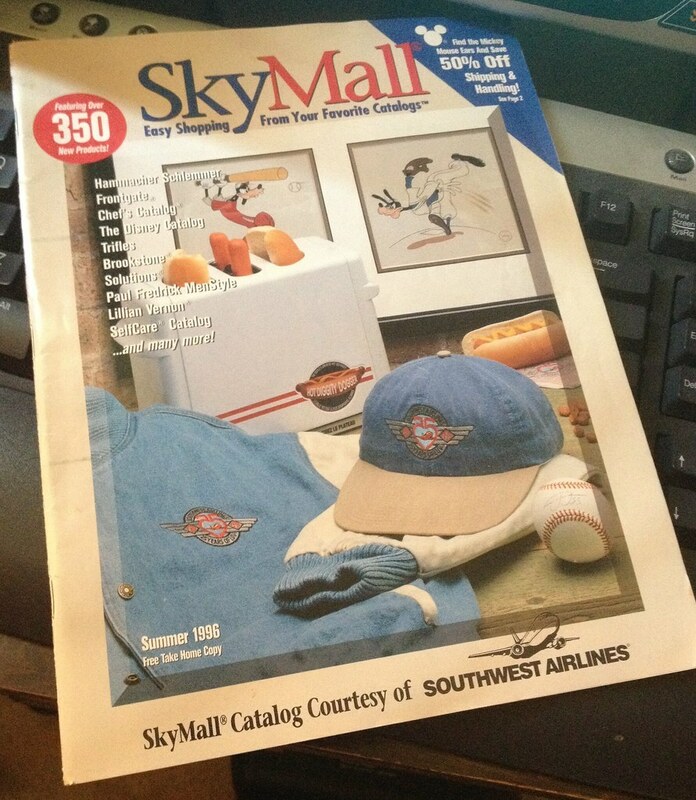 Actually, this SkyMall had a ton of 900Mhz cordless phones which were brand new at the time. All for around $200 (super affordable!). 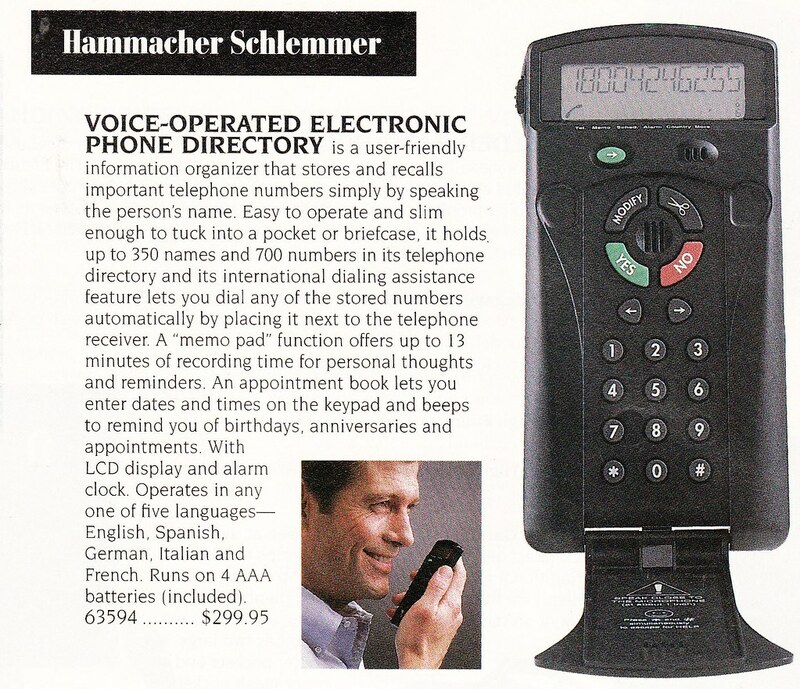 The one in this add is $199.95 and this was around the time that the caller id display was first being put on the handset instead of being a separate box you attached to your phone (we had the separate box). Personal electronic phone directory. Essentially a digital rolodex. However, it does allow you to place the gadget next to your real phone’s receiver and it’ll create the appropriate tones that’ll automatically dial for you. It’s like the Jetsons up in here! Digital voice recorder to keep personal reminders, telephone numbers, names and addresses. How will you ever fill up that EXTRA LARGE 1024Kb of memory (about 1Mb)?! 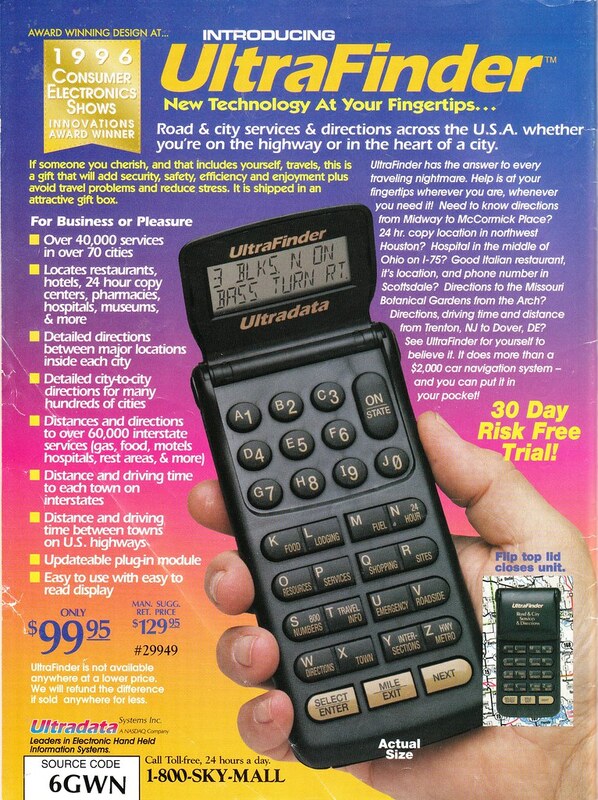 This is what existed before GPS. It’s like looking at a window into the Middle Ages where people churned their own butter. Detailed directions on an easy to use display? No and no. 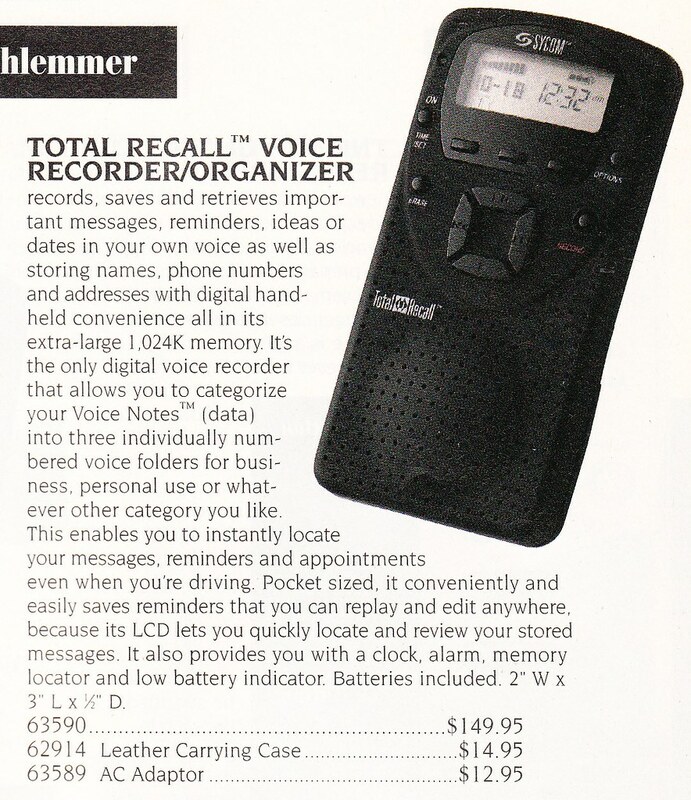 It’s sort of surprising to me that this hunk of gadget is only $100 while that Britannica on CD set was nearly $500. WTF?! 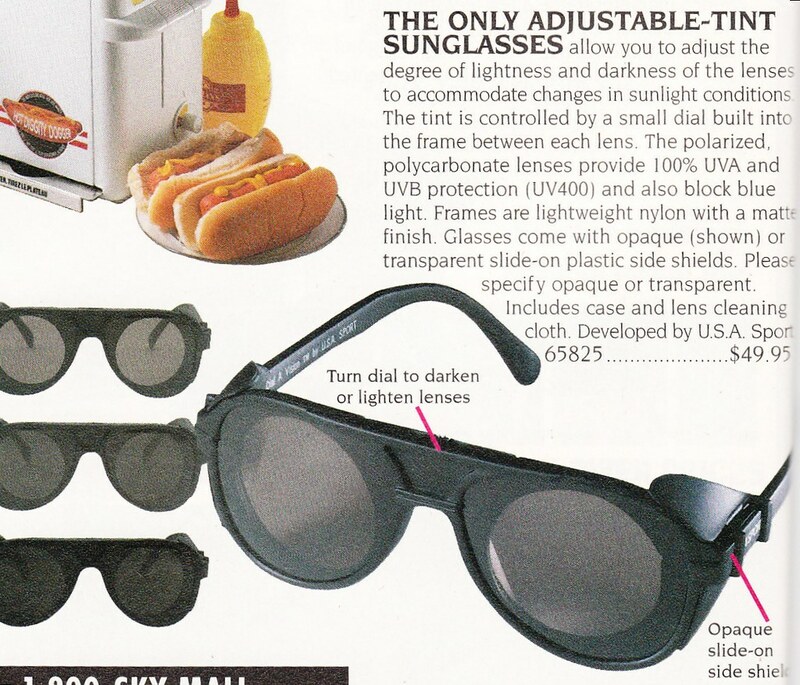 This entry was posted on August 25, 2014 at 7:30 am and is filed under magazine, nostalgia, pop culture with tags magazines, pop culture, SkyMall, technology, vintage. You can follow any responses to this entry through the RSS 2.0 feed. You can skip to the end and leave a response. Pinging is currently not allowed. We’ve come a long way, baby! 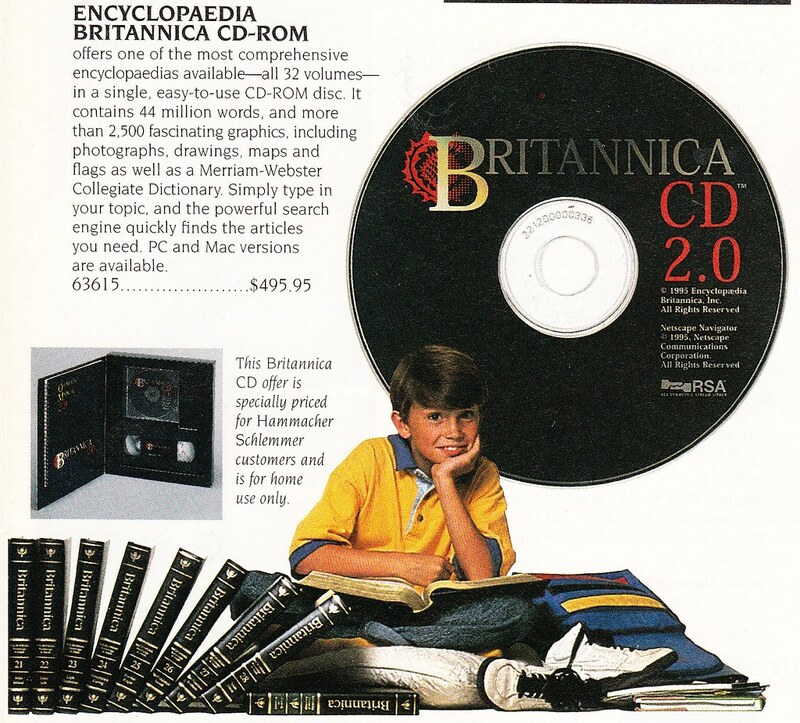 It’s amazing to think how amazing products like Encarta were back then — it even had videos! Totally, Brian! It was a MULTIMEDIA Encyclopedia. Blew my mind. 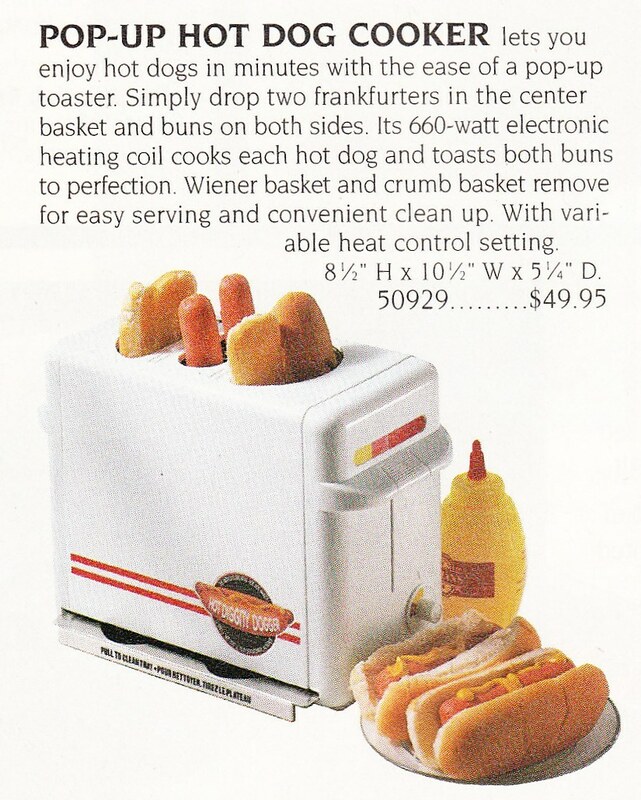 I hope to god that scott never sees that hotdog toaster. He still hasn’t forgiven me for removing the hotdog roaster off of our wedding registry. I just emailed it to him. YOU’RE WELCOME. I imagine the fourth slot was for gumballs, red hots, Mike & Ikes, etc. A shampoo/conditioner dispenser was mounted in both showers in our home when we bought it. I wanted to remove them ASAP, but HImal was like, “hellz no!” Ours has four sections as well. One holds Himal’s shampoo, one has shower cleaner, and the other two are empty. Perhaps I should fill those with wine?